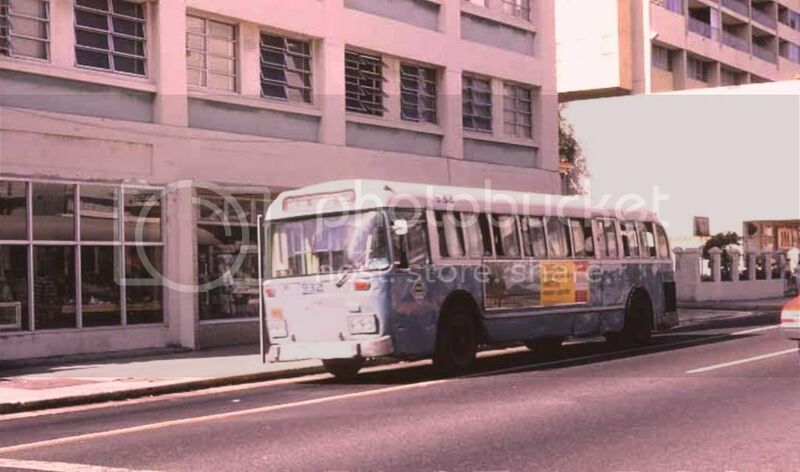 Seen in 1971 somewhere within the environs of San Juan, Puerto Rico is fleet #932 - a 1960 45 passenger Mack Model C-47-DT and one of 75 likenesses operating for the Metropolitan Bus Authority of that Caribbean capital city. While #932 features a transit body and seating configuration, its passenger windows are full height sliders much like those found on a showcase and are the only known example of this style on a Mack. #932 also shows what Mack referred to as a 'New Look' front clip which was designed and licensed to Mack by Niagara Frontier Transit System of Buffalo, New York (San Juan elected to remove the fancy stainless back plate decoration in which the headlights and Mack badge were encased). This order of coaches has significance as being the last to be built by Mack before ceasing all bus manufacture in February of 1960. Photo courtesy of 'pl8dog' and is available at eBay as item # 321188613497.